DocTools HighlightManager can help you save a lot of time if you often highlight text in Word. You can highlight text with any highlight color with a single click. You can also remove highlight with a single click. You can apply or remove the highlight via a dialog box that can remain open as you work. You can also apply or remove highlight via customizable keyboard shortcuts. The add-in includes other unique features. 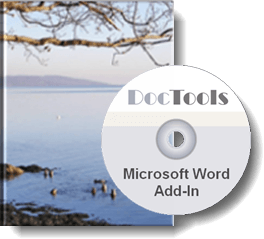 DocTools HighlightManager works with Word 2010, Word 2013, Word 2016, Word 2019, Word for Office 365 on PC. Read on to learn how DocTools HighlightManager can help you. Single user license only EUR 15 - volume discount - see Pricing details below. The text to the left shows examples of highlighted text. Applying highlight is a useful way to make content stand out. 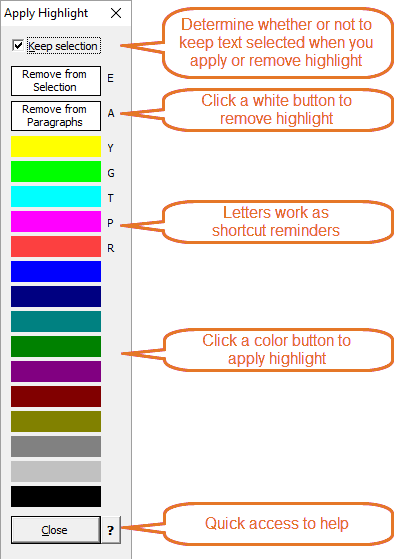 Highlight can be practical both during the editing process of documents and in final documents. DocTools HighlightManager adds a tab, DocTools, with a group, Highlight, to the Ribbon. If the DocTools tab already exists, the Highlight group will be added to it. Note that the built-in highlight functionality will function as normally and can still be used. The Apply Highlight command opens the dialog box shown to the right. The dialog box can remain open as you work, always ready for use. The dialog box lets you apply any highlight color or remove highlight with a single click. The Define Shortcuts command lets you define shortcuts for different highlight colors and for removing highlight. In addition, you can define keyboard shortcuts to the Find command and the Apply Highlight command. This way, you do not even need to have the Apply Highlight dialog box open - simply press the relevant shortcut. The Find command lets you quickly search for highlight in a document. The user-interface (i.e. screen texts in the Ribbon, dialog boxes, help, etc.) of DocTools HighlightManager is in English but the add-in can be used with any language version of Word. DocTools HighlightManager is easy to use. You can start using it immediately but it is recommended to spend time on familiarizing with the functionality in order to take full advantage of the features. You will find more details about the highlight features below. The dialog box lets you select from the highlight colors supported by Word. I use highlight colors a lot and have always found the built-in highlight functionality in Word unpractical to work with if you constantly need to switch between different highlight colors. 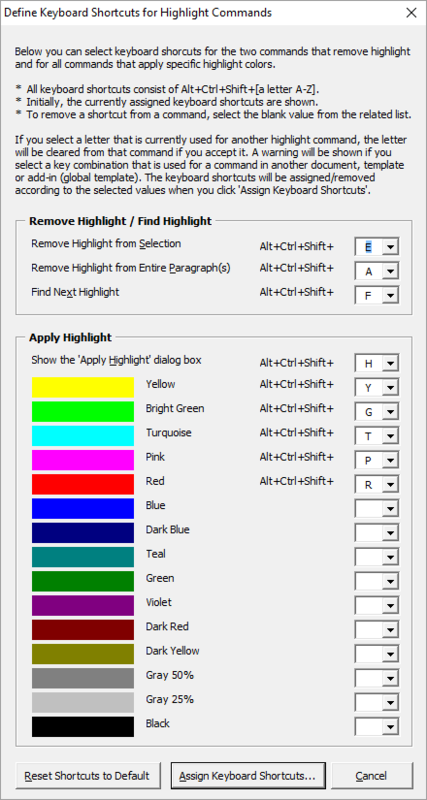 For years, I have been using a small add-in I created that lets me use different keyboard shortcuts to quickly apply the few highlight colors I use most often. I know from questions in misc. Word forums that many Word users would like a smarter way to work with different highlight colors. Therefore, I decided to develop a smart add-in that is flexible and customizable and that lets you quickly apply any highlight color either by using a keyboard shortcut or, alternatively, by clicking a color in a dialog box that can be available all the time. In addition, I decided to add some extra tools to make it fast and easy to remove highlight and to find highlight in a document. The result is the DocTools HighlightManager add-in. The Apply Highlight command opens the dialog box shown to the left. Brief information about the functionality is shown in the balloons. You do not need to have the dialog box open. You can assign keyboard shortcuts to the colors and simply press the shortcut to apply the highlight color. The illustration to the left shows the keyboard shortcuts that have been assigned by default. Removes highlight from the selection only. Removes any highlight from the start of the first paragraph in the selection to the end of the last paragraph in the selection. This means that you can remove all highlight from a single paragraph simply by clicking anywhere in the paragraph before using the command. Highlight is applied to the selection. Highlight is applied to the entire paragraph in which the insertion marker is positioned. However, no highlight is applied to the paragraph mark. The Define Shortcuts command opens the dialog box shown to the left. The illustration shows the keyboard shortcuts that have been assigned by default. You can modify, add or remove shortcuts as you wish. See the information in top of the dialog box for details. Opens a dialog box that let you apply specific highlight colors and remove highlight, and more. Lets you define shortcuts for different highlight colors and for removing highlight. In addition, you can define keyboard shortcuts to the Find command and the Apply Highlight command. Searches forward in the active document to find the next occurrence of highlight, if any. The command will search for any highlight color. Help on DocTools HighlightManager opens a dialog box with help and tips related to the add-in. About DocTools HighlightManager opens a dialog box with information about the add-in (version number, rights, etc. ).